We used to call these ‘giant dandelions’ as kids. Why not, they certainly look like dandelions, even the blossoms look like overgrown dandelions. The Goat’s Beard seed head, looks like a gigantic dandelion. This image is not even a macro, it was made with my 70-300 zoom at a high aperture to show all the detail. I looked at it in amazement. It’s almost perfect, not a single seed has departed. It’s beautifully full and round, I can see right to the centre. The wonder here was that this was not an isolated specimen. There were three or four to chose from, the sun was bright and clear, making for ideal conditions for this shot, along the roadside near Slabtown, on Boulter Road. This is another image from my day trip through Bancroft’s back-country. This entry was posted in macro, Nature, Photography, Plants & Flowers and tagged back roads, ball, Bancroft, Boulter, Carlow-Mayo, closeup, dandelion, Ed Lehming, explore, Goat's Beard, Nature, Nikon D800, ontario, photography, road, Roadside, seed, Slabtown, summer on July 6, 2016 by Ed Lehming Photography. When the elements align, I recognise just how fortunate I am. I’ve also become prepared for many lighting situations which would have challenged me a few years ago. The tree pictured above is one of my favourites. As a “Solitaire”, which is what I now call these lone trees, this one is the one that I visit and photograph the most. Primarily because it’s close to home, and secondly, because the farmer tends to work his/her such that the furrows or plantings draw the eye naturally to the tree. However, this particular ‘moment’ was breathtaking, and lasted mere minutes, as the setting sun shone across the field, bathing the tree in what I’ve begun to call ‘God-Light’. It highlights one particular item and makes it glow with life. I just happened to be driving home from a trip north to photograph the spring melt-waters at Burleigh Falls, hoping that this ‘solitaire’ of mine might be photo worthy. I was certainly not disappointed. This entry was posted in Landscape, Nature, Photography and tagged agriculture, Angie Karan, breathe, country, Ed Lehming, faith, farm, filed, Glasgow, God-light, light, musings, Nature, Nikon D300, ontario, photography, road, shine, solitaire, sunset, Tree, Uxbridge on April 13, 2016 by Ed Lehming Photography. Winter can be such a thing of wonderment. The photo above was made in December of 2014 while on a trip to A Place for The Arts, an artist cooperative in Bancroft, which I am a member of. The drive was generally uneventful, with the occasional blowing snow and a few drifts over the road. There had been a slight warming the day before and a quick cooling down which created a marvelous, almost magical, frosting on the tree branches along the road. It was beautiful to see the frost shining and twinkling in the trees along the road but it was not till we got into open areas with higher elevation that this effect really revealed itself. Along the far shores of Paudash Lake there are several high ridges and all the trees on these ridges were completely encrusted in a thick, pure white, layer of frost. I have rarely seen a scene of such intense purity as it dazzled in the mid-morning sunlight. This is like a scene from Narnia where the White Queen has made her presence known in ice and snow. The frosted pines along the shore just accent the effect. A photo can hardly convey this type of scene, but this one come as close as I could have wished for. By early afternoon the frost had melted, or been disturbed by the wind, and the drive home was nowhere near as beautiful. Now, when I drive along this lakeshore, even in summertime, and look at this shoreline, I will always be reminded of this particular moment in time, when winter came visiting the Paudash shores. This entry was posted in A Place for the Arts, Landscape, Nature, Photography and tagged APFTA, artist, Bancroft, December, drive, frost, Ice, lake, Paudash, pure, road, shoreline, white, winter on January 12, 2016 by Ed Lehming Photography. Today’s post is a bit of a step back in time to 2013. One place I can never get enough of is Yosemite National Park in California. The sheer scale of the landscapes is overwhelming for a ‘flatlander’ like myself. There are opportunities for images that are just not possible where I live. For example, the image above was made while leaving the park after a day of photography. Just when I thought I was saturated for the day, this wonderful scene presented itself. The photo was made from a roadside “pull-out”along highway 41 and highlights the layers of hills that make up the Sierra Nevada foothills. It was late afternoon and it had rained off and on all day. This diffused the light nicely and created a faint mist that lies between each layer. Again, being a rather dull, wet day, also created the nice dark silhouettes of the trees in the foreground. It’s kind of a ‘moody’ image that conveys the type of day it was. I like to think this is a non-typical image of the Yosemite area, which is usually portrayed with images of waterfalls and grand vistas. I have found that the drive to the valley is also very picturesque. This entry was posted in Photography and tagged California, cloud, dark, different, exit, foothills, Highway 41, mood, mountains, pines, road, Sierra Nevada, unexpected, west on December 3, 2015 by Ed Lehming Photography. This has been a beautiful autumn. Generally, by this time of the year, the leaves are down and it’s hinting at the winter to come. It has made photographing fall colors a real pleasure. Bright reds and oranges are everywhere with a nice mix of yellows and some splashes of green, from plants less susceptible to frost. The photo above was made along the 28th Sideline, in North Pickering, Ontario. The old maple trees here create a wonderful canopy over the road and there is not much traffic. The road itself is in the heart of expropriated lands destined, at one time, to become the new Pickering Airport. Those plans seem to have been put on the back-burner and some lands have been designated parkland. These lands, still full of fertile farmland, have fallen into disrepair, with a few farmhouses scattered across the vast acreage. Fields are still actively worked, but it has lost the feel of a once vibrant farm community. The one gain in this situation is that there is a lot of land that has not been absorbed in urban sprawl and large expanses of rural wilderness can still be experienced here. I go to this spot every year, and it remains largely unchanged. A fun fact for me is that the eastern tree line (on the left side of the photo) is the eastern limit of the farm my mother-in-law grew up on. I’m sure she and her brothers played in these trees at some time. 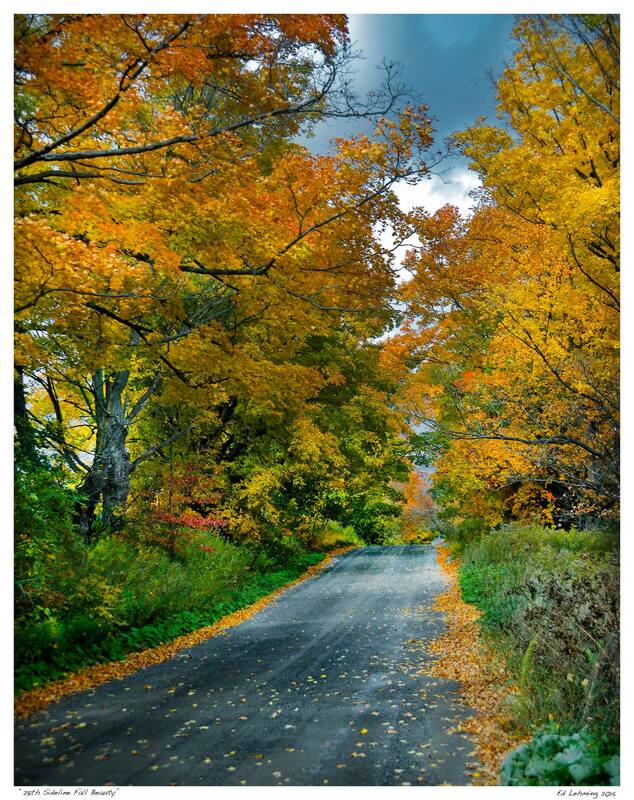 This entry was posted in Photography and tagged autumn, beauty, Canada, distance, expropriated, fall, farm, maple, Pickering, Pickering Airport, road, rural, sprawl, time on October 23, 2015 by Ed Lehming Photography.